LG Electronics’ mobile business chief Cho Ju-no said Thursday that the company’s upcoming flagship smartphone G5 will offer differentiated value to customers, exuding confidence in the imminent battle with competitors Samsung Electronics and Apple. “Even though LG Electronics is beefing up its budget smartphone lineup, it will focus on delivering fun and exotic value to customers through premium products like the G5,” Cho said. He was fending off market concerns over LGE facing off Apple’s latest mid-range iPhone SE handset. 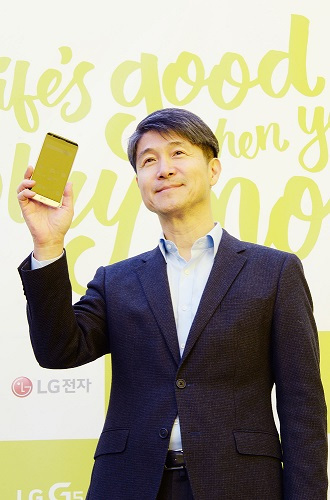 He made the remarks at the opening event of a product experience zone for the G5 and its accompanying device lineup, dubbed Friends, in Seoul. Apple recently released the 4-inch iPhone SE, which is said to offer similar performance to the iPhone 6s, but at a lower price. The price of the new iPhone SE starts at $399, compared to $649 for the iPhone 6s. CEO Cho also hinted that the firm’s first mobile payment solution LG Pay will hit the market as early as the first half of this year. It has not been decided whether subsequent LG smartphone models will adopt a module-based design and be compatible with G5 modules, according to the CEO. Industry watchers anticipate that the G5, the mobile payment, and the Friends devices will be able to lift the earnings of the company in the coming months. KB Investment and Securities estimated that sales of the G5 will exceed 100 million units this year, surpassing the record first-year sales of the G3, which was 70 million units. In line with marketing efforts ahead of the upcoming release of the modular phone G5 and the Friends devices, the company will run large-scale product experience zones in posh districts in Seoul. This will begin in Garosu-gil, an upscale district with cafes and fashion shops, and the Times Square shopping complex in Yeongdeungpo-gu on Friday. An experience zone, called LG Playground, will be launched at the IFC Mall in Yeouido, Coex shopping complex in Samseong-dong, and Hyundai Department Store in Pangyo and Sinchon by the end of this month. The tech giant came up with the “Playground” marketing scheme to promote the handset and Friends devices. The zones include a 360-degree camera, a ball-shape rolling robot equipped with a camera, a drone, and virtual reality goggles. The G5’s removable battery can be removed from a slot at the bottom of the handset and attached to several Friends devices -- including a camera and a portable audio system -- to power them.